This post is the fifth in a 5-part series, featuring Evernote as a Kanban Calendar setup. One of the handy things about Evernote is that there numerous (possibly gazillions) of onramps - tons of ways of getting stuff into your account. Not only that, but there are literally thousands of apps out there that you can authorize to access your Evernote account and send/ harvest/ hone in on/ extract specific information, and in many cases allow for a 2-way sync. Over the next 5 weeks, I will be showcasing 5 3rd-party Evernote apps that do a spectacular (if not totally unique) job of managing your tasks - in Kanban Calendar fashion. "An API is a software intermediary that makes it possible for application programs to interact with each other and share data. It exposes a specific software functionality while protecting the rest of the application." In the next post (5a), we're going to be looking at Swipes, a task-list app that harvests any/ all of your checkbox items from Evernote and allows you to reorder them to your heart's content within their app. Take a look at the Authorization dialogue box pictured here and see what Swipes can and can't do to your account. "An open API is an application program interface that provides a developer with programmatic access to a proprietary software application. Open APIs are published on the Internet and shared freely. A startup software company, for example might publish a series of APIs to encourage 3rd-party developers to be innovative and figure out new ways to use the startup’s software product." If you take a look at the Evernote App Center, you'll see loads of very smart and innovative apps that take advantage of Evernote's open API (I've done a lot of tinkering with some of these for the purpose of my Kanban Calendar system). In fact, Evernote holds the annual Evernote Platform Awards, which "celebrates the best apps that connect to Evernote." (By the way, Swipes was the winner of Best New Startup this year). I believe it is for this very reason that you shouldn't hold your breath hoping for Evernote to one day roll out a fully-fledged, ready-made task management solution in-app. They'd be disenfranchising so many app developers who have built around Evernote... and in so doing, would be shooting themselves in their big elephant foot. They are too invested in putting their Cloud API out there for 3rd-party app developers to go to town on. The Borg, from the Star Trek franchise, were a collection of species from different planets that had been turned into cybernetic beings to form a pseudo-race. The Borg forced other species into their "hive mind" through a process of assimilation, and in an episode I watched, forewarned the Starship Enterprise: "Resistance is futile. We wish to improve ourselves, to have your biological and technological distinctiveness. Your culture will adapt to service ours." - The Next Generation, S03E26. The Evernote API does not allow such a degree of access to 3rd-party apps so as assimilate and fully control your account to its detriment. The relationship is a whole lot more mutual and benign. A win-win setup. The relationship between a 3rd-party app and Evernote leverages the other's technological distinctiveness, as we will see in coming posts. Through the assimilation of a range of technologies and knowledge, the Borg came to be among the most powerful entity in the galaxy. 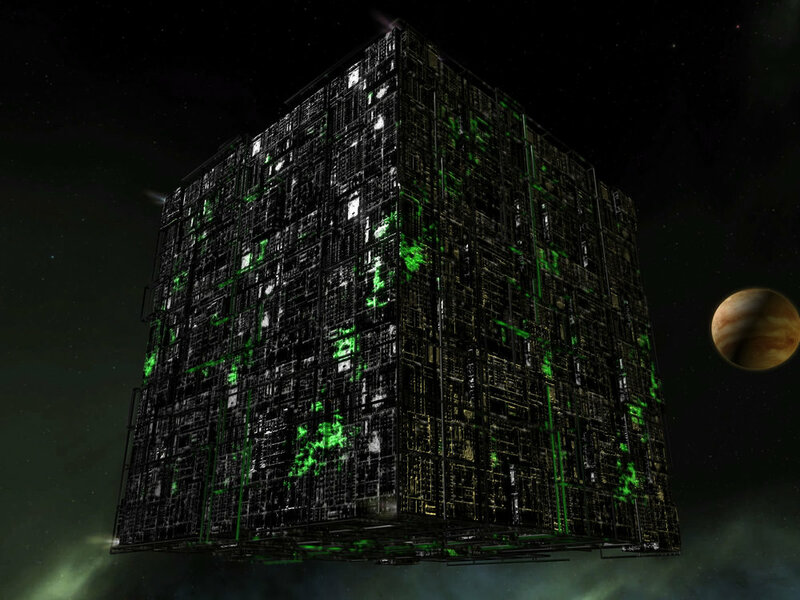 The Borg comprised a population of drones and had technologies integrated into their bodies which enabled them to function within the Collective. A neural transceiver, a device that was implanted in the upper spinal column, granted access to an individual's brain and kept them connected to the hive mind. When two apps sync via the cloud to one another, it's a beautiful thing. More often than not, there is a seamless back and forth of information exchange, no matter what device you're syncing from. They're all in communication, just running in the background. In the case of Captain Jean-Luc Picard, who was assimilated into the Collective (designated Locutus of Borg) and who was their intended spokesperson for the assimilation of the human race, it took the annihilation of a Borg Cube to disconnect him from the hive mind. In a less dramatic fashion, if one wanted to disconnect any 3rd-party app from Evernote, it would simply mean going along to your Account Page and under "Applications" you could revoke their access individually. Quick and painless. After assimilation a drone had no sense of individuality and served only the Collective. In the next 5 posts, we'll be taking a few Evernote 3rd-party apps for a test drive. Each app has it's own personality (whether big or small) and unique distinctiveness. You may just latch onto one or more that help you to figure out a workflow unique to you.